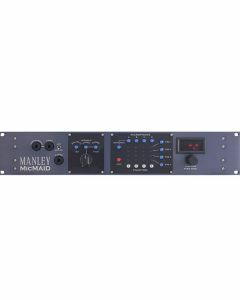 The MicMAID matrix-switcher saves precious studio time and dramatically increases efficiency by allowing for “live” audition of up to four mics and four preamps in any combination. With its convenient level-matching capabilities, user-programmable routing schemes, and thoughtful monitor features, the best mic/mic preamp combination for every session can be instantly chosen. Any mic, any preamp, any time. Any mic, any pre, any time. Plug your four favorite mics and micpreamps into the MicMAID, and pick the best combination for every session. With its convenient level-matching capabilities and user-programmable routing schemes, this is the ultimate tool for auditioning and comparing your finest equipment. Get ready to find the sound you're looking for faster (and easier) than ever. Start cleaning up YOUR workflow with a MicMAID. The MicMAID was designed to fill a particular niche in the business that has never really been addressed: auditioning and selecting microphones and microphone preamplifiers. Proper pairing of mics and preamps has always been (and always will be!) a vital step in the tracking process, but there has never been a simple, accurate way of doing this. Since we are in the business of providing tools to professional sound engineers, we saw this obstacle as an opportunity to flex our design muscles and create something that could finally fill this void. In the past, records were made in studios. Big studios, with big consoles, with banks and banks of microphone preamplifiers. With a console full of micpre's available, it was easy to audition several microphones through four almost identical preamps. In today's world, however, most do not have this luxury. In a home studio, most people only own a few preamps and a few microphones. With a conventional patchbay, auditioning gear takes time - muting monitors, unplugging sources, repatching, adjusting gain for the new microphone or preamp - and in this time, our memory for the sound we just had a minute ago (or more) has faded. We might recall a general idea ("breathy", "boomy", etc.) but we don't REALLY remember precisely what we were hearing. With the MicMAID, this problem is solved. Four mics are plugged in, four preamplifiers are plugged in, and that's it. Hear any mic through any pre, any way you like. For each of the four signal paths, levels are easily adjusted and saved - this level-matching fixes the all-too-common problem we encounter when we just assume the "louder" signal path is the "better" signal path. Subtle sonic differences between pieces of equipment are now instantly percievable, with a simplicity never previously available. In addition to the four main outputs the routing matrix provides, there is a fifth output labeled MON/REC on the rear panel. Although this is described as a "monitor" output, this output can (and should) be used for recording purposes - for it is only this output that utilises the active components of the MicMAID. These include the level-matching capabilities and the Variable Phase section of the unit. When the continuously variable phase circuit is selected, it allows you to easily phase-align the selected mic signal (or the front-panel DI signal) with another microphone. This phase adjustment has an all-pass filter with two selectable center frequencies, making it useful on a variety of sources. With four passive hard-wired signal paths and its versatile monitoring section, we'd like to think that the MicMAID can help you find the sound you're looking for just a little quicker than you could before. It's a tool of the trade, and as with all tools, you should feel free to be creative and think up new ways to use it that make your life easier and your recordings better. Gain Ratio: 12:1 Step down. Note: Mon/Rec active stage ALWAYS "looks" at selected PREAMP as its signal source.